Don’t hesitate to call (816) 886-7600 if you are experiencing an issue with your gas line. At All-n-One Plumbing, our team is ready to provide expert solutions to all of your gas line installation and repair needs. Find out more about our online discounts and specials by visiting our coupons page! Keep things in order with our gas line installation and repair services. If your home in Independence, MO or Greater Kansas City area home has appliances that use natural gas or propane for power, such as a gas-top stove, then properly maintaining your home’s gas line should be a top priority. At All-n-One Plumbing our team of qualified professionals is happy to offer gas line repair and installation services to keep you safe from gas leaks and to ensure that your gas line has not been compromised. 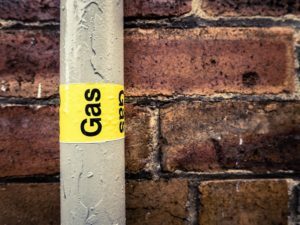 How Can You Tell If You Have a Gas Line Leak? The vegetation in a particular area of your yard is dying no matter what you do. You hear hissing sounds near your gas lines. Recent extreme weather has led you to believe that your line may have been affected. You have recently had issues with a gas-burning appliance that may have damaged your gas line. You broke the gas line while doing landscaping or renovations. You can smell sulfur, or rotten eggs, which is the scent added to natural gas to make it easy to identify. Be sure to call for expert gas line installation and repair services you can count on from our team of qualified technicians. Expect prompt, reliable service: Our technicians value your time and your business, so we won’t keep you waiting or take longer than necessary to finish our work. We’ll quote it for free: We’re happy to come and visit your home and offer free, no-hassle estimates on every job. We offer personalized solutions and positive attitudes: This means that every solution we provide for you takes your unique needs and situation into consideration. We can scrape your pipes clean: If stubborn clogs are an issue we can blast away the caked-on debris with professional hydrojetting services. Just ask us about it! We’re family owned and operated: Put your trust in a locally-owned family business that has been working in your community since 2007. There is no gas line job too big or small for our plumbing specialists, so no matter what issue you are experiencing be sure to call (816) 886-7600 for service in Independence, MO and the Greater Kansas City area.